I wanted to watch this movie because I was looking for an exciting psychological thriller and I like to go back to the older movies as they often proved to be excellent in this particular genre. Baby Jane felt like it will be exactly what I was looking for. However, I was deeply disappointed. 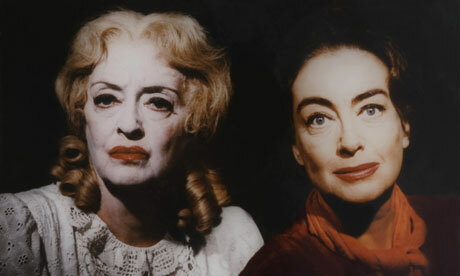 First off, I love Bette Davis (Jane) and Joan Crawford (Blanche). Nonetheless, their characters really got on my nerves because they were so over the top, both of them. Bette with the excessive “crazy person” look and Joan with the excessively polite person behavior. The movie wasn’t thrilling at all – it’s more of a drama than anything else. I don’t think there was one moment that held me on the edge of my seat, except maybe the one where Blanche is trying to get to the phone downstairs. At the same time, though, I was irritated by it. Every time Jane would go out to run errands she would be away for a long period of time, giving Blanche enough time to seek help in many ways. Yet all she did in that time was one or two activities like eating candy or trying to get down the stairs. What, this took her hours? I know she was in a wheelchair but come on! If you’re afraid for your life you’ll frickin’ drag your body down the stairs if you have to. And you’ll do that as soon as your abuser left the house, too. Another thing that really irritated me was Blanche’s complete incompetence. What, she couldn’t scream out the window when she saw the neighbor? She couldn’t throw things out to get somebodies attention? It’s not like they were living in the woods, away from all forms of civilization. Imagine you’re being held captive in your own house and you manage to get to the phone AND call for assistance. Would yo beat around the bush or scream “come help me right now, my sister is crazy! Come NOW!!!”? For me, the whole movie is totally unbelievable. I don’t blame the actresses but the director, producers and scriptwriters. The movie’s full of plot holes and poorly executed storyline. That’s why I give it a 6/10 rating.